UV lamps generate harmful levels of ultraviolet radiation that can cause serious skin and eye damage through only a short exposure. 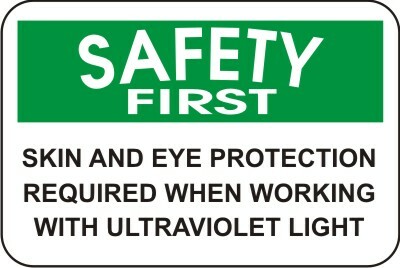 Extreme care should be taken when working in and around UV equipment. Be careful not to place any part of your body in the direct UV light and do not look directly into a UV light. UV lamps also emit a narrow band of ultraviolet light that reacts with directly oxygen creating ozone. Ozone has been found to cause headaches, respiratory irritation, and other more serious heath problems. It is very important that all UV curing operations have proper ventilation to prevent the accumulation of ozone. Because of the instability of ozone, it typically quickly converts back into oxygen during the ventilation process.